The most recent ego trip for pastors is for us to have staff members take photos of us and create “memes” from them. A meme is a photo with some kind of pithy saying on it, often encouraging or motivational. 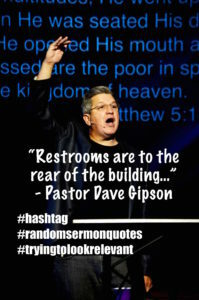 Text is added to the pastor’s photo that is basically a quote taken from his sermon the last Sunday. The idea is to make you think the pastor said something original, unique, important and quote-worthy. But I’ve noticed, they are often rather mundane statements you’d hear in an average Sunday school lesson.